"Rust on the silos is the nightmare of every grower"
The past year was completely dominated by major developments at Bucon Industries. For example, Peter Bulsing transferred his position as Managing Director to Erik Passchier. 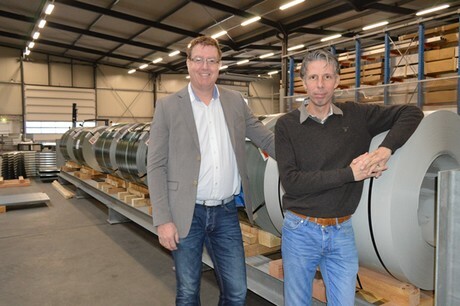 Both gentlemen are well known in the horticultural sector, and from Bergschenhoek Erik is now in charge of Bucon Industries - because the move to Bergschenhoek is now a fact. Previously the offices were already moved, and at the end of 2018 also the machines were moved from Leeuwarden to the southwest of the Netherlands. Soon everything will be set up and well aligned in the production hall. The move was naturally also a good moment to look at optimization of the machines. Erik Passchier: "Of course, the silos that we produce meet the highest requirements. However, our production employees had a few interesting ideas and we were able to implement these immediately. We have carried out an upgrade that again gives us extra possibilities." In Bergschenhoek Marc de Loyer has also assumed the function as Back Office manager. Marc: "The machines have been offline for about two weeks, but because a large stock of semi-finished products was produced earlier, the deliveries could just continue normally." 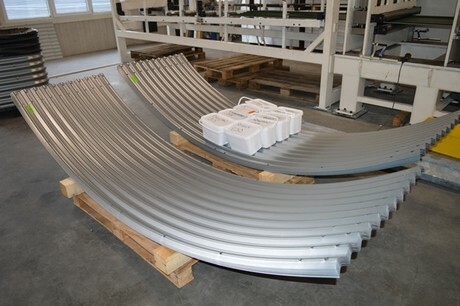 The flat, already coated steel is corrugated by an almost forty meter long profiling machine. Rust on the silos is the nightmare of every grower. A silo can be rejected, or even worse, tear open, and thus cause great damage. 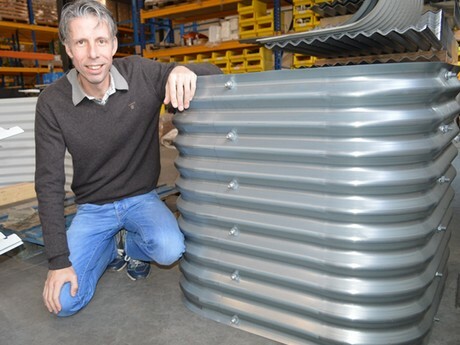 Bucon has been able to make an agreement with steel supplier Arcelor Mittal that they have the exclusive rights to use Magnelis for corrugated steel silos. Magnelis galvanization consists of a patented combination of zinc, magnesium and aluminum. Erik: "Through long-term research the optimal relationship between the three materials was found. The result: extremely good anti-corrosion properties compared to all other forms of galvanizing." Erik: "This steel is rust-resistant to such a degree that the coating is not really needed anymore. There will always be a demand for coated silos, even if only from an optical point of view, so we simply supply them. But I dare to supply this steel without coating." Erik Passchier next to a special square silo where it is clearly visible that the lower and upper waves are facing outwards. Also the structure was looked into again. Both the bottom and the top wave of the steel are facing outward at the Bucon silos. Otherwise the bottom wave has a tendency to bulge away somewhat during the ‘settlement’ of the silo, so that the lower row of bolts can be pressed into the ground. And at the top, the pulling power of the sometimes heavy liner, sometimes combined with a tension tarpaulin, also can cause problems. By having the last wave also facing outward, the steel braces itself, as it were, against this kind of pressure. So here too, extra sturdiness is created. Incidentally, there are also customers who, for example in view of the replacement of panels, want the wave outside, and that is also possible at Bucon. These two silos only need packaging to be ready for transport to the customer.